Many organizations leverage Microsoft Active Directory® (AD) as their directory solution. Unfortunately, AD presents a number of challenges for IT admins when attempting to connect a wide array of non-Microsoft resources to it. This is especially true as these organizations move resources off-premises to the cloud, adopt new operating systems like Mac and Linux, and face the challenges of integrating new offices and remote personnel under AD governance. The risk to organizations increases dramatically when IT resources aren’t centrally managed and controlled. 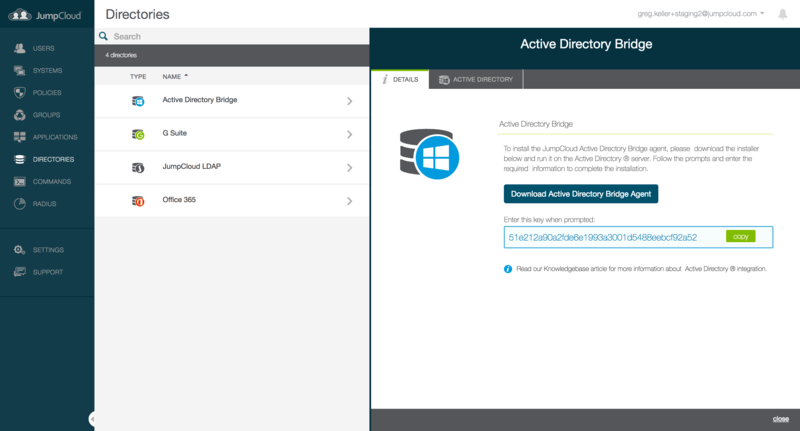 JumpCloud’s AD Bridge extends identities managed in AD to resources that are not directly bound to the AD Domain Controller infrastructure. As a result, AD remains your master authority, and user identities are extended to all of the resources they need access to – both on-premise and in the cloud. A lightweight and secure agent is installed on Windows Server domain controllers to communicate AD user and group membership changes securely to their copies managed in JumpCloud. Control Windows, Mac and Linux Systems outside your domain. Users imported from AD can be leveraged on Windows, Mac and Linux systems for secure authentication needs. Take advantage of JumpCloud’s system management features such as command execution, multi-factor authentication and policies without the need to bind these systems to AD directly, nor require a VPN connection for check-ins and updates. 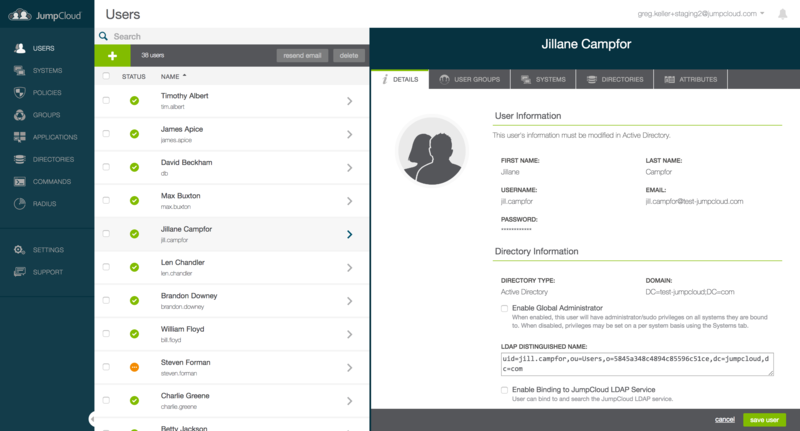 Import AD user accounts and their group membership into JumpCloud. JumpCloud’s Domain Controller Agent will keep changes in constant sync from password changes to account profile changes to group membership. JumpCloud’s AD Bridge enabled a continual sync from AD to G Suite or Office 365 identities without the need for installing and managing middleware utilities such as Google Cloud Directory Sync or Azure AD Connect. JumpCloud will securely transmit all password and account profile changes directly from Active Directory to those services to keep them in constant sync. Imported AD user accounts and groups can leverage JumpCloud’s vast array of cloud-based protocols. JumpCloud’s cloud RADIUS services can authenticate AD imported identities to the various networks within your remote office with no need for a local domain controller. Leverage JumpCloud’s LDAP endpoint to bind AD user accounts to on-premise and cloud-based resources requiring standard OpenLDAP authentication from applications such as Jira or Jenkins, to NAS devices like Synology or QNAP. You may also leverage the ability to use JumpCloud’s array of SAML 2.0-authenticated portfolio of web apps, federating AD user identities with no need for ADFS or other AD add-ons. Supports Active Directory on Windows Server 2008, 2012 and 2016. Authentication services for remote/unbound Mac, Linux, and Windows systems. 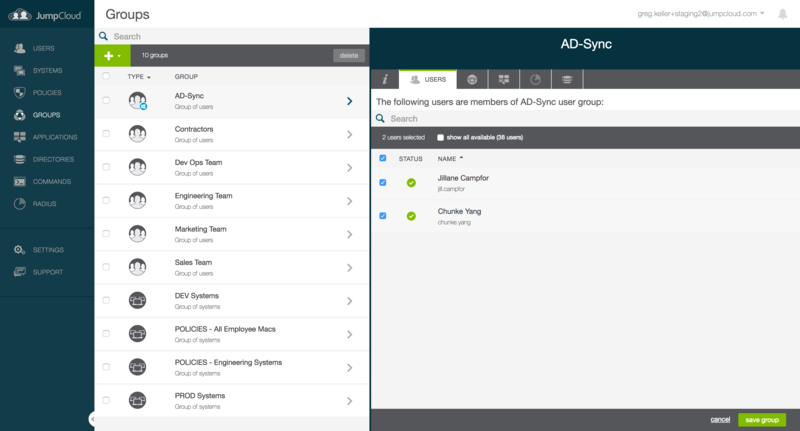 User and group synchronization for all or selected objects. AD to JumpCloud password and data synchronization in seconds. Authenticate AD user accounts through JumpCloud’s cloud-based LDAP, RADIUS, and SAML services. Multi-factor authentication services for JumpCloud synchronized user accounts on Mac and Linux systems. Maintain a centralized identity scheme and allow AD to be the master authority of authentication. Control access to Mac, Windows and Linux systems not directly bound to AD with AD credentials. Simplify authentication to remote and non-supported resources unconnected to AD without VPN. Improve security by reducing identity silos and connecting all resources to AD mastered identities. Eliminate on-premise redundant LDAP servers to manage hosted server infrastructure. 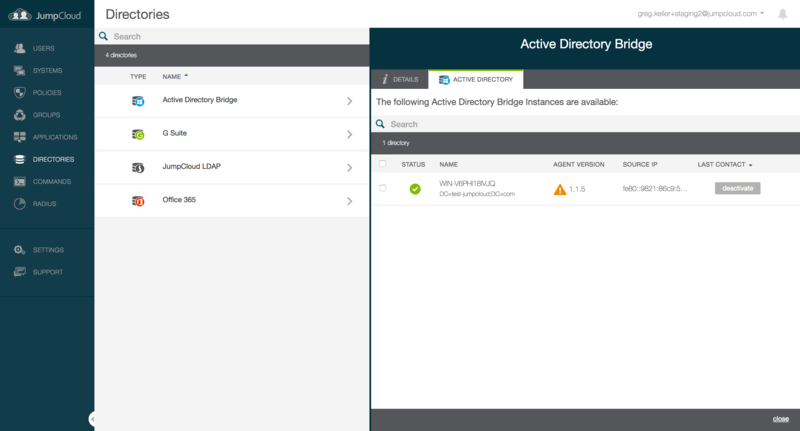 Learn more about the AD Bridge feature by visiting our “Using AD Bridge” article in the support documentation.